9:00am – Sportsman racing is in progress under bright, but partly cloudy skies. It’s 80 degrees but feels much hotter in the bright sunshine. Eliminations for professional classes are slated to begin at 11:30 CDT. 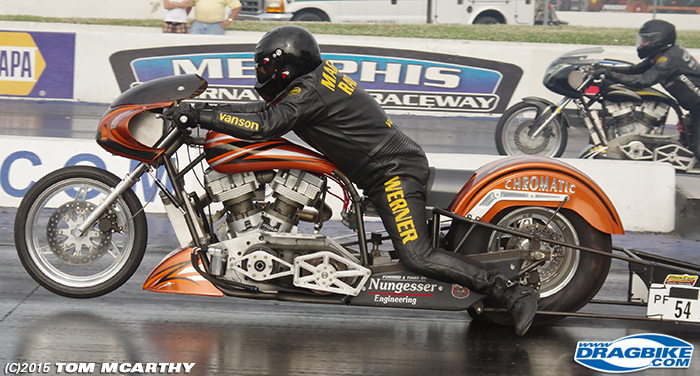 10:00am – Yesterday in Super Eliminator Alex Hughes set the Record on an all motor H2 at 8.21. And while many people took notice of Roger Starrette’s Mousey Real Street pass, most of us missed that he ran his personal best with a 7.738! Congrats to him! 11:30am – Sportsman are still going down the track and the Pro classes are due up in 30 minutes. Check out all the tabs above for this weekend coverage and our Fathers day article by Tom McCarthy. 1:30pm – We have completed the first round of Pro qualifying. All videos have been uploaded to the Weekend Video Playlist. Chris Hand was unable to make it in time for eliminations as he continued repairs from last nights blow up. We may get to see him out later today for a test pass. In Pro Street Mike Kovacevich had a wild ride taking his bike to almost 90 degrees at half pass. In Real Street, Rickey Gadson was a no show for first round giving the Pro new comer, Ben Knight a bye into second round of his first Pro event. 1:45pm – Down for an oil down. 3:30pm – Second of Pro Eliminations are done. In Pro Fuel Jordan Cruz took the win over #1 qualifying Rocky Jackson. In Pro Mod, Grothus, House and Wilburn advance to the stem-finals. In Pro Street Gladstone, Hable, Yoder and Sanzoterra will face off in the semi-final. Tombo Racing showed up with 9 motorcycles for competition and they are still coming back round after Round. Thanks to Tommy Bolton for bringing his crew out to support the Man Cup Series. 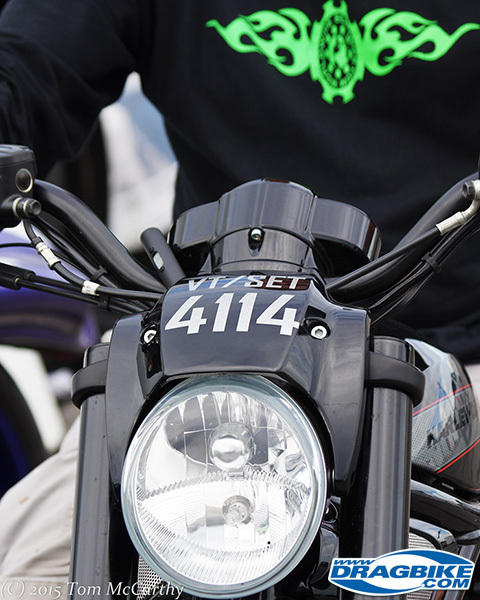 Check out the Pro Open Videos to see his beautiful motorcycles! 6:00pm – Semi of the Round rounds are down and we will begin round robin mode for the racers. In Top Fuel Hogan gave McBride a good run with a 6.69 to McBride’s winning 6.18. In Pro Fuel Dustin Werner took the win over Jordan Cruz! In Real Street Anibal Merced will face off against the 2104 Dragbike.com BAMF Jeremy Teasley. 7:00pm – We will not be making updates until the end of the event so we can cover all the final rounds. 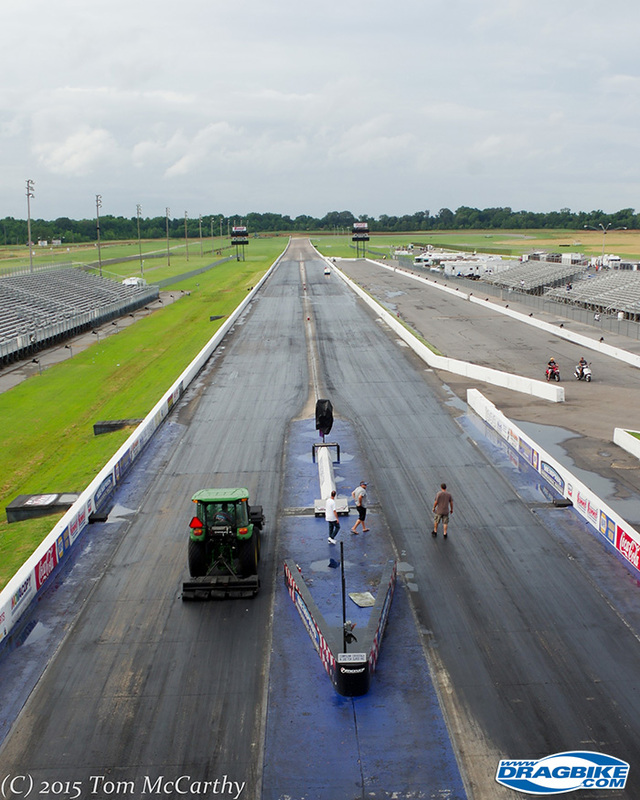 9:55am – Good morning from Memphis International Raceway, in Memphis, Tennessee. We have clear blue skies, it’s 75 out but feels like 80 and we are in for a great day of racing! 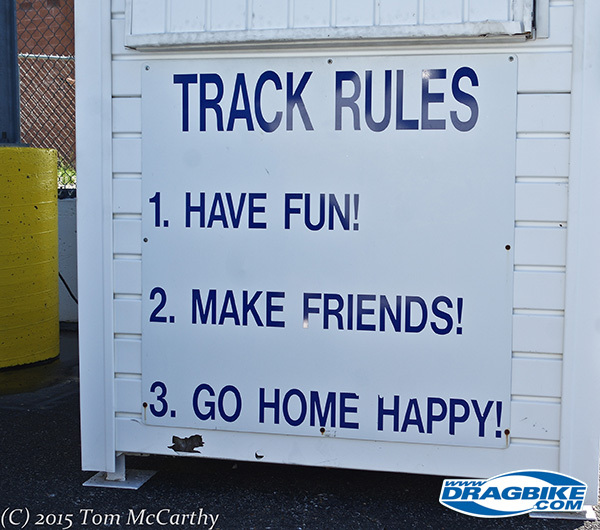 10:00am – Sportsman and ET racing is on the track and we are right on schedule for the Pro classes at 11:30. 1:30pm – The first round of Pro qualifying turned out to be a struggle with most competitors. The debut of the Alwine Top Fuel Team was disappointing for many when the mechanic problems kept them form making their first pass. But their fans are easily awaiting fro them to come back out later today to make another go of it. Dave Vantine was the only Top Fuel to actually salvage a pass with a 9.24 ET. In Pro Fuel Dustin Werner, Rocky Jackson and Janette Thornley were on top with a 7.361, 7.362 and 7.477 respectively. Chuck Wilburn lead the 11 bike field Pro Mod class with a 4.165. And while many struggled in Pro Street, the DME racing team managed to tune their bikes to the that tot take the top two qualifying spots. Joey Gladstone took the #1 spot on his with a 6.958 on his freshly changed set up. Joey’s bike has already gone through the changes to fit the upcoming rule change. Terence Angela ran a 7.098 for the #2 spot. Pro Open delivered some wild rides, cone removals and line crossing with half of the field unable to break a 8 second ET. 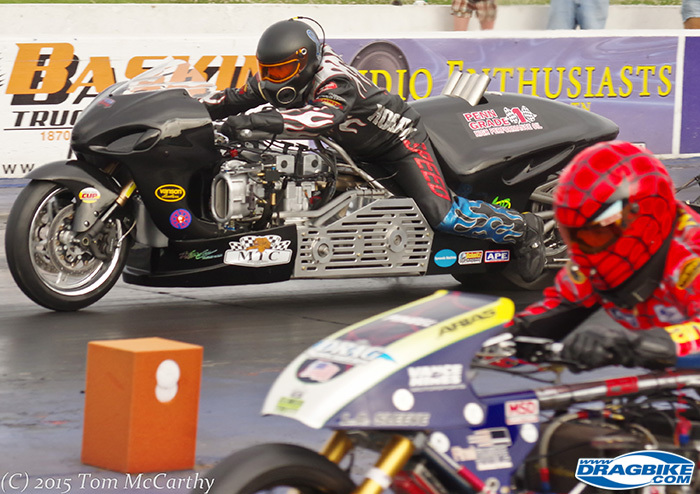 Mark Rendeluk came out on top with a 6.770 in the 12 bike field. In Real Street Ben Knight made his Pro debut and performed spectacularly qualifying in the 3rd spot with a 8.685. Anibal Merced took the top qualifying spot with 8.065 to keep his top qualifying streak going. 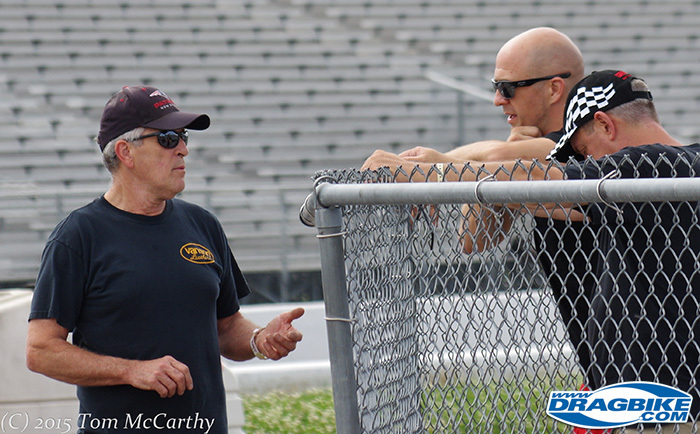 3:15pm – Thank to Les Stimac and Greg Scott for bringing the Dragbike.com crew water and saving our lives! 4:00pm – Eddie Krawiec from Vance and Hines is in the House! Apparently he just doesn’t get enough of being at the race track. 6:15pm – The most exciting action from round two qualifying was Roger Starrette’s pet mouse getting away during his Real Street pass! WHAT, you say. Apparently a mouse ran into the bike at the pit area and the team couldn’t find him and had to head up for their next Real Street pass. As you will see in the video clip below, The mouse jumps out of the bike as Roger is staged into the second beam, and Roger like the professional he is, didn’t miss a beat! 9:00pm – Final round of Pro qualifying is finally finished and we have all the Time Sheets and videos posted. We also have a Top Fuel video of Chris Hand’s Top Fuel blowing up at the 60 foot and Korry Hogan was able to come back and make a stellar half pass. Check out the videos in the playlist below. 9:15pm – Joey Gladstone just made the first pass on the NEW DME Racing Nitrous Grudge bike. I wish we could tell you how fast he was, but thats for the competition to find out. 10:30pm – In D&G V-Twin Michael McManus takes the win over a fouling Chuck Boothe. 11:04 – Grudge Big Money race – Jeremey Teasley on King Pin vs Alex Hughes – The win goes to Jeremey Teasley but Alex gave him hell of a fight after almost losing control at the 330′ and fighting to the bike up right while giving her the gas! It was a wild ride for Alex! 11:45pm – In Street ET Jeremy Teasley took out BAMF contender Ben Knight in the Semi Finals, but his brother Stephen took on Jeremy in the Finals and kept the family name in good standing! In Pro ET John Hanney won over Mark Abrahms. 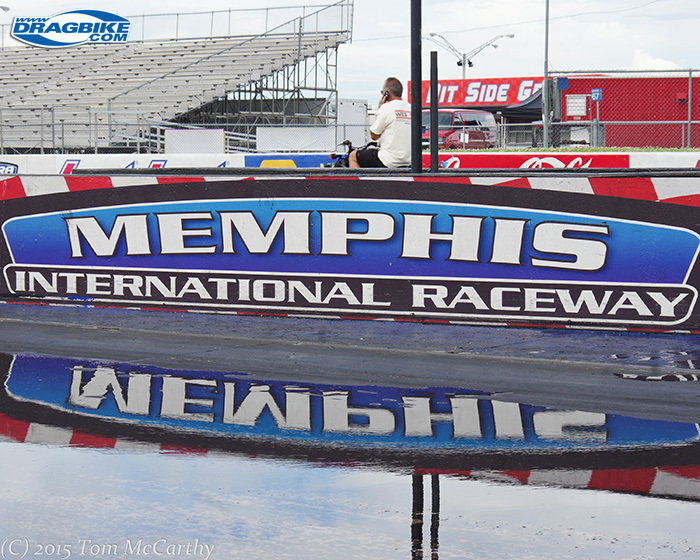 The track received a healthy cleaning off today from Mother Nature in Memphis. Yes, that’s Larry McBride in the back ground making his only pass of the day. The down time made for some good bench racing time as old friends talked old times. Two former Funny Bike racers here, Korry Hogan and Rob Giard caught up for a bit. The Sportsman racers are chomping at the bit, ready for some test & tune action tonight if the weather holds off. Tomorrow’s forecast looks good and Sunday will be hot and sunny. As of 5:30 Friday evening, the track attendants have done a stellar job of drying off the track and things are looking good.